So many of you have been sending me messages about the new Littlemoon book, and I can't believe that tomorrow is the big day!! 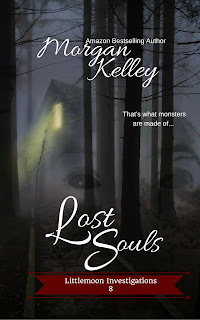 Yes, Lost Souls will be out tomorrow! It feels like just yesterday that I wrote it, and now you finally get to find out what happens. First, you'll meet Willow. She's going to make you laugh, cry, and likely want to mother the hell out of her. Arsen Woods is going to fall for her. What happens when two psychics collide? Will they be able to tame Arsen's new gift while trying to solve one hell of a case? Plus, you're going to meet London and Dallas. You know me. I like to mix it up as much as I can. Nothing will ever be the same as the Littlemoons roll into town to solve a case and 'save' the dead. Yes, I left the last book in a cliffhanger, and that's to prep you for what's coming. You're going to get full resolution in this book. You'll find out what happens to Nyx and Beau. Does she wake up? I will say that Lost Souls will end in somewhat of a cliffhanger, but nothing that SHOULD make any of you angry. I say that knowing there will be a few of you who will likely be upset, but I can't make everyone happy. So, buckle up, get ready, and enjoy the Littlemoon ride. You should have your books (if you preordered) a little after midnight EST. I hope you love it, and I hope you'll leave me a review. It's time to get our spook on. And it's going to be a case that you'll never forget. If you haven't preordered, or you need to purchase on release day, you can find it here.